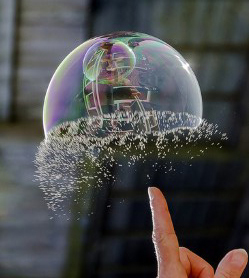 Doc Searls Weblog · Is the online advertising bubble finally starting to pop? I started calling online advertising a bubble in 2008. I made “The Advertising Bubble” a chapter in The Intention Economy in 2012. I’ve been unpacking what I figure ought to be obvious (but isn’t) in 52 posts and articles (so far) in the Adblock War Series. This will be the 53rd. And it ain’t happened yet. We are living through the latest stages of the online advertising bubble, as available high-quality ad space is shrinking, leading to a decline ad space quality, and a decline of ad efficiency. Awareness for fraud is growing, and soon, clients will cut their online ad spending, and demand higher accountability. This will destroy the high-margin market of automated reselling worthless ad space, and will force advertisers to focus only on prime publishers, with expensive ad space. Currently, January 2018 Alphabet puts with a strike of $400 are trading at around $8, for a 20x return should our scenario materialize. Advertisers and the entities that place their ads have always sought relevance and engagement; the consumer has chosen to set a higher bar. Advertisers and the buyers of media have a further responsibility. Until now, we have assumed almost all data are worth having. But however much he gathers, no advertiser commands complete, continuous data. This creates a risk that the advertiser’s left hand may not know what his right hand is doing. A customer who has already made a purchase may be bombarded with redundant repeat ads wherever he roams: what we might call the phenomenon of “repetitive irrelevance.” Even worse, several advertisers may be sharing the same data and using performance-oriented media, multiplying the “repetitive irrelevance.” Tracking and targeting intended to make advertising welcome makes it a nuisance. It is dysfunctional. The advertiser damages his reputation and pays to do so. This brief analysis suggests that a partial solution to adblocking is a combination of design, technology, common sense and the ability to establish the point, across channels and vendors, at which the application of a particular data point becomes the poison of marketing rather than the antidote to ineffectiveness. There are other signs. 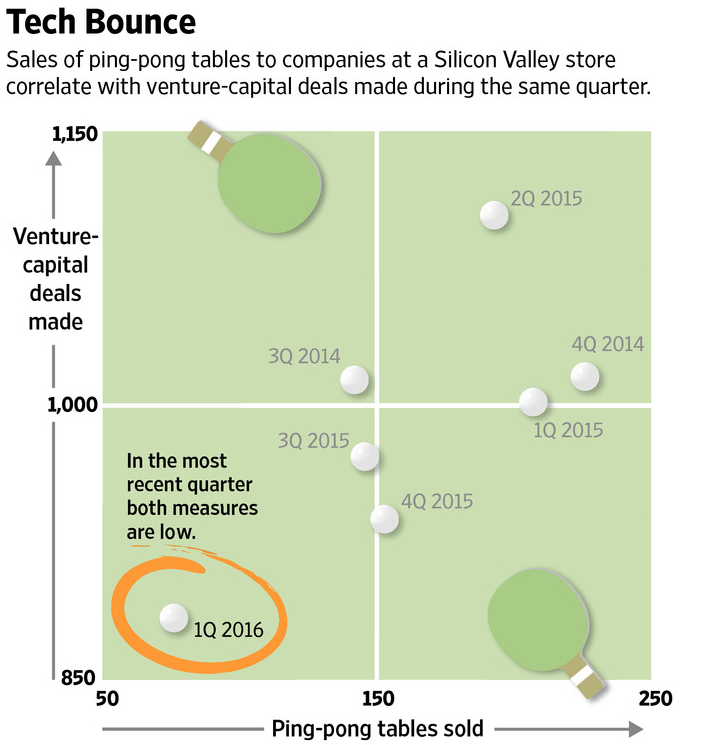 Last May Business Insider said The ad tech sector looks an awful lot like a bubble that just popped. In June, The Wall Street Journal said adtech investment dollars are running dry. “These companies are struggling to even get meetings,” they said. In December Ad Exchanger called 2015 a “reality check” year for adtech. Still, I’ve been told by one (big) adtech exec that his business is “a walking zombie” and that he’s looking toward “the next paradigm.” One of the biggest online advertisers told me late last year that they yanked $100 million/year out of adtech and put it into traditional advertising for one simple reason: “It didn’t work.” I have a sense that they are not alone. Got any more examples? I want us to get as clear a picture as we can of the adtech edifice as it starts crumbling to the ground. Or not. Yet. KMPG Media Tracker, which has a UK survey that says, “47 per cent of high earners say they’ll be using an ad blocker in the next six months, 59 per cent of 18-24 year olds say the same,” and “The group least likely to use ad blockers were the over 65s, at 36 percent. Absolutely true! It’s popping and it’s going to be a very hard landing for many publishers and online services that consumers have come to depend on. Back in 2013, Tim Hwang and Adi Kamdar, researchers at the Nesson Center for Internet Geophysics, published a comprehensive study on the declining value of display, search, and mobile advertising and its potential impact on the structure of the web. The study, The Theory of Peak Advertising and The Future of the Web, examined the impact of declining ad revenue and predicted that most online business models were unsustainable. Their failure will ultimately force a contraction of many popular Web-based services and media outlets, and have dramatic long-term implications for consumers. Fast-forward and many of their predictions are beginning to come true today as several high-profile publishers are now buckling under financial strain. A recent article in the New York Times spotlighted problems at Mashable, which just laid off 30 people. BuzzFeed, Salon, Huffington Post, International Business Times, Gawker Media, and Upworthy also announced budget cuts and layoffs over the last few months. Declining revenue is not limited to online. Other media channels, including radio, newspapers, magazines, and television have seen falling revenue. iHeartMedia, which manages more than 850 radio stations and owns Clear Channel Outdoor is on the verge of collapse. It’s no longer a question of whether it declares bankruptcy, but when, according to Media Life magazine. Thanks, Lionel. In my haste I had neglected to mention Tim and Ari’s Peak Advertising piece. I’ll add it above, and your piece too. I am in the digital marketing biz, and I agree: the display ad industry is dying, and ‘ad tech’ is over-invested. For now. 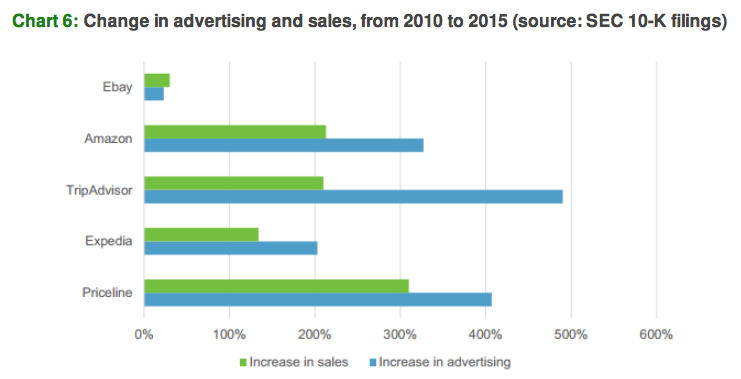 But… there are really three different digital ad sectors. And as far as I can tell, only one is dying. The other two are thriving. The “buyer revolt” is mostly confined to the first and oldest type of online ad buy, display advertising. This is what GroupM is talking about. Also, the vast majority of ‘ad tech’ companies focus on serving and optimizing display ads, which is still the largest ad spend online. This explains the dire predictions. The second digital ad sector, search engine marketing, is moving into the mobile era pretty much intact. Some hiccups, but Google is playing this game well. Earnings and revenues continue to grow in search overall, and mobile search spend is skyrocketing. The short story on what’s really happening is: the third & newest ad sector, social media, is eating the budgets we used to spend on the first sector, display advertising. As a result, social media advertising is doing REALLY well, which Facebook’s extraordinary earnings growth shows. Some of Facebook’s success comes from ad buyers who are ‘testing’ Facebook for ROI. But I know many companies who are getting outstanding ROI buying Facebook ads. So, they continue to increase their budgets, at the expense of display ad spend (still the largest ad budget online). As far as Google losing 75% of its company value: I think you’re too pessimistic. This is because Google only gets ~15% of their earnings from display ads (AdSense). The rest of Google’s earnings come from ads displayed in their search engine apps (AdWords). For the most part, search ads do not suffer from visibility, click fraud or questionable ROI. In fact, most ad buyers LOVE them. They just can’t afford to buy as much as they need, because there’s a natural limit to the number of queries people enter into Google every year. And about that decline in Google’s cost per click (chart 1): It’s actually due to a change in product mix: specifically, fast-growing ad sales on YouTube, the second largest search engine in the world. Click prices for video ads are 1/10 that of Google AdWords, because watching a video is not a sign of purchase intent like a search engine query is – and there’s a LOT of inventory to sell on YouTube. If you take a step back, you’ll see that Google is more than compensating for the drop in average click price by selling a LOT more ads: overall, GOOG earnings continue to grow. Due to these well-established buyer trends, Facebook and Google should continue to increase their earnings faster than other companies, for the foreseeable future. Which should translate into share prices going up, not down. On the other hand, display-ad-dependent businesses – which include most of ‘ad tech’, most traditional media companies with a digital presence, and digital-only media properties like Yahoo & HuffPo – stand to lose the most value as ad buyers place more ad buys where they can be targeted, tracked and deliver reliable ROI – i.e., spend more $$ with Facebook & Google, and less on display ads embedded in their websites. The data shows this is exactly what’s happening. At a macro level, I don’t see anything that tells me that TOTAL digital marketing spend is poised to slow. Just the opposite. For what it’s worth, I am a professional online marketer today. I’ve been working in ad tech, online marketing & eCommerce since 1995. The online marketing industry has gone through 2 big sea changes since I started (display ads, followed by search). Today, we are going through TWO big changes simultaneously (shift to mobile + rise of social media). These days, I don’t get paid to ‘place ads’, like many ad agencies do. I get paid when our marketing delivers a sale and the customer is happy with their purchase. Most of what we do today is called ‘content marketing’ – creating valuable content & decision-support apps for very specific types of buyers who are looking for product comparisons, advice, answers to questions, etc. We use digital ads to market our content & apps – not products or brands. This trend towards marketing problem-solving content has been building steam for about 7 years, and it really took off in the past 2 years. That’s because you don’t really have a choice: traditional ads don’t work on smartphones. We gleefully stopped buying display ads 2 years ago, due to their horrible user experience, impossible tracking & poor results (duh). I hate them. Always have. Today, our Facebook & search budgets continue to grow quickly, and the results we generate from each dollar we spend – our ROI – is going up, not down. For us, anyway, the business justification for buying digital ads has only gotten better, not worse. Just not in display ads. They’re toast! Just sharing one online marketer’s perspective re. what I see going on. Thanks, Vernon. Good distinctions there. Two things (among many more I don’t have time right now to explore). First, I’m not the one saying Google will lose all that value. Kalkis is. Don Marti, whom I trust on this stuff, tweets that the Kalkis report is “bogus” at least to the degree that ad fraud is “built in.” I think it’s still an helpful take on the whole marketplace. I also agree that Google and Facebook, for the reasons you cite, are safe for awhile. What’s in danger is the four-dimensional shell game that too much of adtech remains today. Second, do you see a distinction within display between plain old non-tracking based ad placements (which may still be inserted by programmatic means) and the kind that are based on tracking? For more on what I mean, see Separating advertising’s wheat and chaff. Re. ‘wheat’ vs. ‘chaff’: yes, big difference between tracking-based placements and blind inventory fills. But the ‘wheat’ is completely screwed up, too (as you know). In general, the ad-targeting/tracking industry is hugely dysfunctional and really doesn’t work. There’s a LOT of tracking going on, but very little benefit being delivered to the advertiser or the consumer. In fact, the vast majority of targeting data/trackers do NOTHING to lift sales performance nor improve the relevance of a message. Everyone in the display ad biz knows this. But the unanswered question remains: what is the alternative? As a marketer, I view the solution to the “ad targeting” problem as having two axes, not just “wheat vs chaff”. These 2 axes are Targeting Precision, and Message Relevance. Axis #1: Targeting Precision: is the impression precisely targeted on the right person, at the right point in his/her buying or decision making process? When it comes to targeting precision, the choice isn’t binary – it’s a wide, gray scale that runs from “serendipity!” to “WTF?”. Almost all third party data today is supposedly being used to improve targeting precision. There are many kinds of targeting data in the display ad world, and each type is supplied by someone different. Contextual, intent, demographic, temporal, behavioral triggers, life cycle triggers, you name it. This is the n-dimensional data problem you speak of. Facebook is doing a lot to resolve the n-dimensional problem, right now. As they build-out their offsite ad network, they are gaining real time access to most of the important types of targeting data and organizing them into detailed interest and intent profiles of individual people. Now, Facebook really needs to beef-up their purchase intent signals, so guess what? they’re adding Buy Now buttons. You don’t have to purchase anything, you just have to click that button. Then, Facebook can sell 100 high-priced impressions against that signal. – Inventory fill algorithms: most ads today aren’t ‘targeted’ by people who know their audience well, they are placed into available inventory slots using algorithms designed to optimize fill rates and financials. But we the people don’t give 2 you-know-whats about either of those outcomes, do we? Bottom-line, we’re doing this all wrong! optimizing fill rates and click through rates tells us NOTHING about whether an ad was properly targeted or not. – Third-party data quality is generally AWFUL. This is something no algorithm can overcome. Unless Facebook gives advertisers access to their high-quality data trove (which will never happen), then only Facebook knows best. Which is kinda scary to just about every media company and advertiser in the world. – Willful ignorance: due to the way agencies are compensated for media buys, very few people on the buy side really understand what any of this data means… so… what were we doing, again? You get the idea. LOTS of work to do. Axis #2: Message Relevance: is the message relevant to me, the individual? When measuring relevancy, the plot is more of a double-bell with a really skinny middle. The message is either close enough to meeting my immediate needs to feel relevant, personalized & useful – or it’s not. Creating & testing a relevant message is a lot easier to do, once you can target small audiences precisely and reliably. And, personalizing a message for an individual is quite easy to do, if you know their personal details. Once again, Facebook holds the ‘data cards’ on making ads more relevant. Facebook is missing dynamic ad optimization (which Google Doubleclick offers), but the Facebook engineering team is more than capable of building that out. Short story: if there is a future for well-targeted ads/content/messages, Facebook will be a huge part of it. So will Google, because search remains the king of purchase intent data. Nothing comes close. The real question, ISTM, is how we will pay for content. In a recent BBC radio analysis programme, “The End of Free” the Guardian journalist Andrew Brown looked at the impact on journalism. Surprised that nobody here is bringing up the alternative of realtime, user-originated auctions of the opportunity to bid on providing a product or service to the user. Although you might want to check here for services already doing that or leaning in that direction. Wendy, the impact on journalism has mostly already been felt already, as countless journalists have either been put out of work in the new digital media world, or found a way to stay employed by reducing their work to mere “content.” (As John Perry Barlow once put it, “I didn’t start hearing about ‘content’ until the container business felt threatened.”) Many journalists, myself included, make money because of their writing, rather than with it. For example, Linux Journal used to pay me well. Now I write a column every month for free, because I want the magazine to live. Most of the money I make is through speaking and consulting. I’d make none of that if I didn’t keep writing in places like this. it’s very gratifying to see that you took our piece seriously. I’m not an industry insider, so I tried to analyze it from the finance perspective, with the tools that I’m comfortable with (financial statements, and reading a whole lot about the subject). It’s really worrisome how obscure the industry is. Digging into Google’s 10-K, I actually got the feeling that they try to make it impossible to understand what they do. They provide no actionable data, market segments are bundled together, we have no clue of who their clients are or how they behave. Frankly, if a small company tried to pull that off, nobody would invest in it. It’s all about “we’re an amazing business, we’re different from the rest, just trust us”. Well Enron did that, too. The difference is that Google actually makes money. I get the feeling that something is very wrong underneath. We continue to look for clues… just posted a new piece, more down-to-earth (https://kalkis-research.com/traffic-laundering-how-google-finances-piracy-with-its-clients-money). Our hope is that we’ll get more feedback that will further guide us in this jungle. Democratize ads and watch the standard go up for everybody while measuring higher profits. More democracy, higher standards and higher profits benefit all. Back in the Usenet days, search was supposedly going to be for us users — enabling us to gopher, er go find whatever out there in the world we could adequately describe. I already knew most of the information I wanted wasn’t in text form in some database yet — I had to ask a brief and interestingly worded question on an appropriate newsgroup to jar the info loose in someone’s brain and have it trickle down through the fingers and keyboard. Of course that meant a question that did show I’d made a fair effort already, and people could check whether I’d summed up prior requests for info in ways that made them findable for the next kid along who searched for that. That worked wonderfully well. I had splendid friendly arguments with my local “supersearcher” whose profession was knowing where all the databases were and how to structure queries to get information. I argued search would improve by making her job obsolescent — ‘oogle’ or something would enable anyone with information to describe it easily and make it available and keep it updated, so people could find, well, anything and everything. Supersearchers would, I predicted, be even more valuable because advertisers would need their help adequately and accurately describing what was out there available to people — so the search tools could help people find just exactly what they wanted or needed and tell people what they’d found and what they thought, to help the next kid along. Then it changed. Graphics. This “web” — and I could envision the advertising industry backing their truck up to the Internet and bolting the ad engine onto the wrong end of the Internet. They hooked up to the input and flushed it backwards — instead of using the industry money and data to improve search, they filled search results — even “let’s look over here ….” — with crap. Advertising showed up everywhere — the industry has always used Tralfamadorian communications, using “tapdancing, farting icons” as Vonnegut described their way of talking. But you could look away — until the web started filling up. Now the only thing worse is, you guessed it, animated billboards for distracted drivers. Push, push, push, clutter, fog, debase. What was I looking for again? Well put, Hank. As good a summary of what’s happened as any. Thanks! Perfect reply, Chip. Are they listening?